A luxurious combination of perfect red roses and lush green foliage, carefully arranged in an elegant slim waisted vase. The red and green complement each other perfectly. It’s a really clean, classic look - perfect for Valentine's Day. 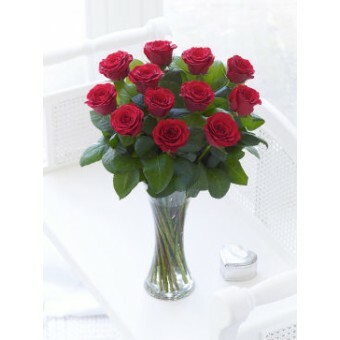 Featuring beautiful red roses hand-tied with mixed foliage and presented in a slim waisted glass vase.